In addition to the language course, we offer other services such as accommodation, meals, a leisure program, help with tandem learning exchanges and much more. All Goethe-Instituts in Germany offer German courses. Depending on the course location, we offer single or twin-bed rooms in our guesthouses or student hostels. Most locations also offer apartments and rooms in shared apartments or homestay situations. We will also be happy to book you a hotel room. At some institutes we offer breakfast and/or lunch on course days. We know how important it is to feel at home when learning a foreign language in new surroundings. Consequently, you can book accommodation through all institutes in Germany. We offer single or double rooms at our guesthouses, in student hostels or in homestay arrangements. 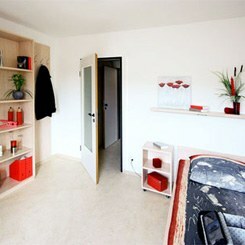 Furnishings and facilities may vary in student hostels and homestay arrangements. Please check the web pages of the institute you will be attending. At most locations we can offer shared or one-room apartments. We will also be happy to recommend a hotel if you wish (prices available on request). Just let us know your preferences when you book your course. The earlier you book, the better the chances that we will find the accommodation of your choice. The Goethe-Instituts in Bonn, Dresden, Düsseldorf, Frankfurt, Göttingen and Munich offer a limited number of apartments with their own kitchen and bathroom. Please contact the institute directly to enquire. You will receive fresh bed linen and towels when you check in and at regular intervals. The costs for electricity, water and heating are included in the accommodation price. Free wireless Internet access is available in the rooms of the Goethe-Institut. The guesthouses have Internet access and/or WLAN available. You will need your own laptop or other wireless device. Access is free of charge (with the exception of the apartment house in Frankfurt-Sachsenhausen). For legal reasons, our homestay hosts are unable to provide Internet or WLAN access. However, you can obtain a prepaid USB dongle from a mobile telephone service provider on presentation of ID. We'll be happy to provide you with information on terms and prices in advance. In addition, many cafés and restaurants provide free wireless access. The user is liable for the legality of data uploads and downloads. Washing machines and dryers are available in the guesthouses. In homestay situations you may use them by arrangement. Prices in commercial coin laundries: approx. €2–3 per load. Pets are not allowed on the Goethe-Institut premises or at your accommodation. An exception is made for guide dogs. Are you expecting visitors, or would you like to travel with your partner? Please contact the Goethe-Institut well in advance to find out whether we can offer accommodation and what options are available. The deposit payable before occupancy of rooms in guesthouses is a maximum of €100 (payable in cash on your arrival date). This deposit will be returned to you on your departure date provided the room is left in good condition. The furnishings of the guesthouses vary: All rooms are furnished, and some are also equipped with an internet connection and a separate bathroom or shower. In many guesthouses, common rooms or music rooms are available for use. Wheelchair users: These institutes are accessible to wheelchair users: Dresden, Frankfurt, Mannheim-Heidelberg. Düsseldorf is accessible only to sports wheelchairs. Prices vary according to the room category and length of stay. Our customer service staff will be happy to discuss the accommodation currently available. We will be happy to recommend good, moderate-priced restaurants near the institutes. In university cities, our course participants can also use university canteens and cafeterias. The Goethe-Institut's tandem programme brings you together with Germans who are learning your native language or want to learn about your country. During the tandem meetings you can alternate between German and your native language while discussing issues and topics of mutual interest. This is an opportunity to get to know Germany and the German people and try out your language skills.